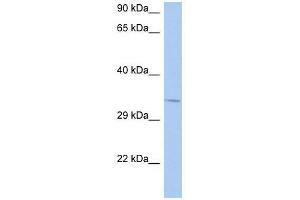 NAPB antibody (70R-10558) used at 0.2-1 ug/ml to detect target protein. Background NAPB is required for vesicular transport between the endoplasmic reticulum and the Golgi apparatus. Synonyms: Polyclonal NAPB antibody, Anti-NAPB antibody, N-ethylmaleimide-sensitive factor attachment protein, beta antibody, MGC26066 antibody, MGC48335 antibody, SNAP-BETA antibody. Buffer Lyophilized powder. Add 50 µL of distilled water. Final antibody concentration is 1 mg/mL in PBS buffer. Storage Comment Store at 4 °C, following reconstitution, aliquot and store at -20 °C.